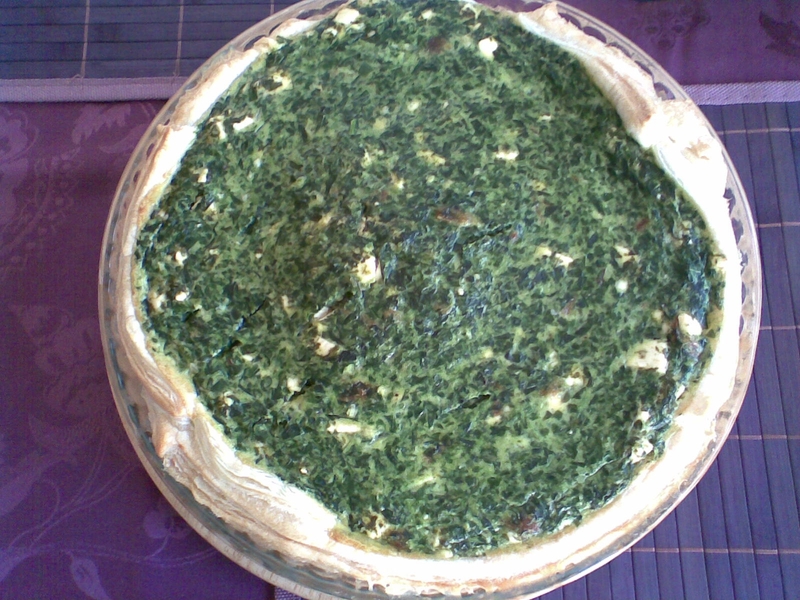 You will need 1 lb (450 g) frozen spinach, 1 puff pastry, a few cloves of garlic, one onion (you can take the roasted one), black pepper, 1/2 lb (250 g) feta cheese, two eggs and some butter. Unfreeze the spinach (in a closed pot) and leave it for a while to cool down. Add the crushed onion, garlic, a very good shot of fresh milled pepper, the feta cheese you cut in small pieces and the two eggs. Mix it all with a spoon. Don't add salt, the feta cheese is salty enough and adding some extra salt is not a good idea (believe me, I tried it once). Butter a baking pan for tartes (watch the picture) and prick it with a fork. Add the spinach mass. Bake around 40 minutes at gas mark 6 (about 200°C/390°F) for 40-45 minutes. After 30 minutes prick it with a fork a few times. Enjoy the tarte with some fresh yogurt or with Greek tzatziki. Backing a tarte at this temperatures is more than crazy - After I closed the door to the kitchen I had the feeling to be somewhere in a desert after I came in after a half of hour to check it. Learn out my mistakes!!! But the tarte was like always... A DREAM. Even granny loved it. I was really surprised!